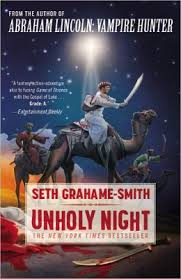 I’ve now read two Seth Grahame-Smith novels: Abraham Lincoln, Vampire Hunter and Unholy Night– and still haven’t seen the movie of Abraham Lincoln, but I will, eventually. I think Smith is a good writer and adept at adapting history to suit his purposes, similar to the way that Marie Brennan does in Midnight Never Come and the other Onyx Court books. I also think that reading books that adapt history are more appealing when you don’t completely remember history class, which I don’t. So Abraham Lincoln was a very enjoyable read for me. I could read it and think, “That sounds right,” but I know if my husband read it, all I would hear about is how Smith twisted history to suit his own purpose. Sweetheart, the man is a writer, it’s what he does. Abraham Lincoln and Unholy Night were both easy reads for me. I even managed to get through Unholy Night when my son was only two months old. I could read it while he slept on my shoulder and not have to think too hard. Abraham Lincoln was even believable for me; I could think back to history class and remember the events and the vampire subplot could be true. And since the vampires were supposed to be a secret society, maybe it was. I enjoyed the fact that the plot had an element of possibility, similar to Suzanne Johnson’s Royal Street in New Orleans during Hurricane Katrina. And what I liked most about Abraham Lincoln was how passionate Lincoln was- here was a historical figure that once lived and breathed and when I was reading about him, he became more than a figure from history class. Smith’s Lincoln had a cause, multiple reasons to hunt vampires. Some of those reasons were very personal- the attacks on his mother and his son- and some were more because Lincoln was a good man and wanted the vampires destroyed. He wanted to end the slave trade because slaves provided vampires with cheap, easy meals; vampires could pick the slaves that no one else wanted, offer a low price and feast on the unfortunate souls. What made Lincoln more awesome was the fact that he could see that not all vampires were completely evil. He worked alongside at least one vampire to wipe out many of the more evil vampires. Although there is a point when he turns his back on all vampires, but he never blankets all vampires with the “evil” designation. The best part of the novel is the end; because some men are too great to truly die. (Probably butchering the line, but I don’t have the book with me). slaughtering of the innocents by Herod after Jesus’s birth. That never bothered me. What bothered me was the fact that I know the Wise Men didn’t arrive at the stable for a few years and Jesus was almost two when Joseph and Mary fled to Egypt; but the novel takes place in the week since Jesus’s birth. But that’s really my only issue. And again, everything pulled together. I could buy Mary and Joseph’s struggles, Herod’s diseased and very twisted mind, and that the Wise Men were more Wise Guys. I enjoyed how Smith brought everyone full circle, that the captain chasing Mary, Joseph and the baby Jesus would one day rise to become Pontius Pilot and sentence Jesus; that two of the Wise Men turned over the Holy Family to Herod’s men and later hung on the two crosses next to Jesus. This stuff is what makes good writing better. And there’s even an element of romance amid the chase and violence. All in all, a very good book to read. However, I’ll never be able to read it around my in-laws. I might have to design a book cover to wrap around it. And can anyone tell me if Herod really was into necrophilia?